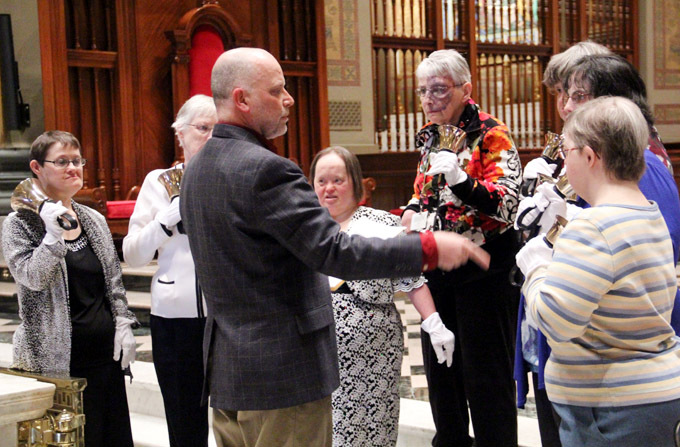 The bell choir from Divine Providence Village, led by Marty Hyde, performs as a volunteer service to their peers and guests before the annual Mass for Persons with Disabilities April 12 at the cathedral. 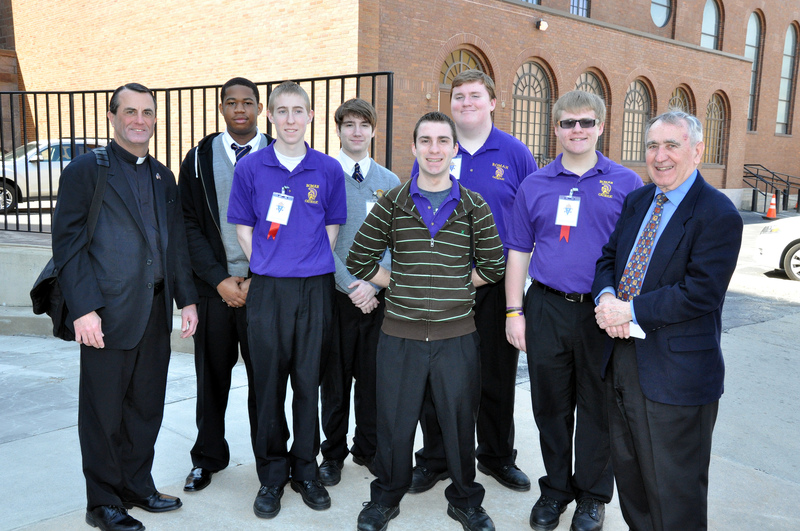 The contingent of students from Roman Catholic High School who volunteered to help at the annual Mass for Persons with Disabilities April 12 pose proudly by the Cathedral Basilica of SS. 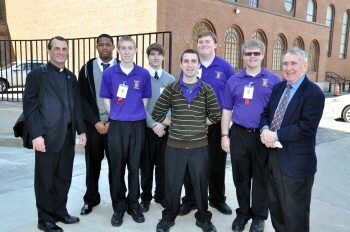 Peter and Paul before the Mass, along with Roman Catholic’s president, Father John Flanagan. Sometimes it’s the little things we do in life that make the biggest difference, even if we never realize it. Take the annual Mass for Persons with Disabilities, celebrated this year on April 12 by Archbishop Charles Chaput at the Cathedral Basilica of SS. Peter and Paul. There were volunteers of all ages on hand to help make it happen. Just to focus on one segment, there were youth volunteers galore beginning with the members of the Bell Choir of Divine Providence Village, who offered a musical prelude for their peers, and also singers from Roman Catholic and St. Hubert high schools who provided the liturgical music. The Bell Choir of Divine Providence Village is composed of women with disabilities who are residents at Divine Providence, according to Marty Hyde, who founded the choir and who is a music therapist at Divine Providence. On a more one-on-one note there were the students from Roman Catholic who acted as escorts to those with disabilities both at the Mass and the reception that followed, something that has become a tradition, according to Immaculate Heart Sister Kathleen Schipani, who is the director of the Office for Persons with Disabilities and the Deaf Apostolate. The volunteerism is an outgrowth of another ministry at Roman organized 14 years ago by alumnus Ed Keenan, class of 1954, through which high school seniors visit alumni who are shut-ins or ill. The program to assist at the Disabilities Mass started eight years ago after a call from Sister Kathleen, according to Keenan. In this case he recruited juniors through visitation of their theology classes. Generally he will have 13 or 14 juniors at the Mass and although this could be counted as required community service hours, that’s not really the motivation, he believes. From Sister Kathleen’s perspective it is also a learning experience for those who volunteer to help. “They learn to be much more comfortable with people with disabilities,” she said. John D’Angelo, one of the Roman students, is especially sensitive to the needs of people with disabilities because as a child he had serious health issues that were mostly treated as an outpatient at Children’s Hospital of Philadelphia, where he saw many children with a variety of disabilities. Bob Hanson, another Roman junior, is familiar with people with disabilities because there are some in his own neighborhood and within his own family. The roles that were played by the high school students did not go unnoticed by the adult volunteers who participated. Sharon Shecter, who is a member of Philadelphia’s Maternity B.V.M. Parish Committee on Disabilities, took special notice of one Roman student who was watching over an attendee whose ride home was late. He was still staying with her so she wouldn’t be alone even an hour after the event ended. Which all goes to show, don’t knock the next generation — they are up to the challenge.